March 28 is Respect Your Cat Day. Yes, that’s right. Our feline friends may have a laugh if they could understand what this is because, as everyone knows, they demand and get respect every day. So what’s so special about this day? Anyway, there are many things we can do to celebrate this day. We can, for instance, plan a grooming session, or a party, or a special treat. Or, we can just opt for a quiet, relaxing evening of snuggling with our best fur-buddies. Any of those options are completely appropriate. However, we can also take some time to truly ponder why we love our cats. Cats may have been domesticated originally to tackle pest problems on the farm, but in modern society, even in bustling metropolises, we still have them. What is it about cats that make us want them around, even when there’s no functional purpose? After all, if it’s companionship we seek, there are dogs we can choose, and arguably they make better companions than cats. Cats often sleep up to 16 or 17 hours a day – where do they find the time to grace us with their presence? So, and not to sound selfish or anything, what is it that cats do for us exactly, why do we love them so much? Well, for starters, their very presence helps us with our overall health. We humans find their purring to be soothing. 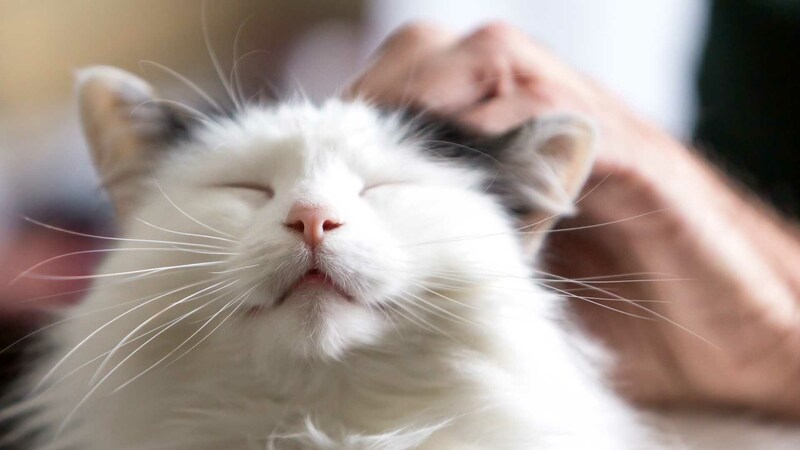 In fact, purring helps cats heal their muscles and bones. Having them right next to our bodies while purring can help us heal too. How’s that for a super power? Their soothing powers don’t end there. Living with a cat has been shown to reduce stress, and more importantly, lower the risks of cardiovascular disease. Just having a cat has been shown to reduce heart disease by a third! Now, some people are skeptical, saying that maybe the types of people who like cats generally have lower stress to begin with. However, there are some logical reasons why having a cat might reduce stress. Cats don’t require constant attention like dogs do. For example, cat don’t demand to be walked or to play fetch, nor do cats beg at the table when you’re eating dinner. Cats prefer to do their own thing, and when interacting with people, they tend to be content being lap companions. This kind of calmness can rub off on us, especially after a stressful day at work. On tough days, we can use every help we can get. It’s clear (to cat lovers anyway) that cats do love us. They might not bark and run around, but they do show us affection and greet us if we’ve been away all day. However, do they see us as their masters? A prominent animal behavior expert believes that they might not. Dogs clearly know who the boss is when we walk into a room. They act differently toward us than they do with each other. Cats, for the most part, do not. They hold us to the same standards as they do with each other, and that’s significant in how they view us. Instead of a master-pet relationship, it’s more like cats are our housemates. Cats deserve our respect. They also demand respect. It’s only right that we have a day set aside for just that. There are other days where we celebrate cats and pets and fun activities we can do with them. This day, however, is about thinking of the many ways in which cats are important to us. In our busy lives, we may sometimes forget just how much we love and respect our cats. It’s a good thing Respect Your Cat Day is there to remind us.